"It is with great pleasure that I wish to recommend the services of Mr. Tim Fichtner as a designer and office planner. I have known Tim professionally for over four years and have personally benefited from his expertise in the design and build-out of our office three years ago. This project culminated in a wonderfully efficient and esthetically pleasing space which won the 2008 National Commercial Builder's Council of the National Association of Homebuilders Merit Award and was featured in the Benco's Incisal Edge magazine. Building this office could not have been without his efforts. One of Tim's qualities is his effort to understand the particular needs of his clients. He spent countless hours looking at my existing space and asking the correct questions about my future plans. I felt the overall design of the office was generated from Tim's excellent understanding of my needs and wishes. The office feels perfect as if it were a dream come true. In any complex construction project, timely and accurate communication between the designer, the planner, the builder and the client is critical. Tim was magnificent in responding quickly and accurately to my many questions. He encouraged my input and respected my ideas. We even shared and edited CAD drawings in a true collaborative spirit. Tim has been designing dental offices for many years and his sense of what elements are critical to the efficient operation of a dental practice is amazing. Tim anticipated ergonomic, environmental and logistical problems which no one else could foresee. His wisdom and knowledge of "real world" practice dynamics resulted in a beautiful, yet wonderfully functional design. Part of this great outcome lies in his attention to detail. The way the door swings, the way a drawer pulls out, the space for easy passage in a hallway, the source and direction of the lighting were just some of the important elements he so effectively developed and designed. During the construction phase, Tim was the most important member of my team, as it was his vision and understanding of the details of each inch of the office which served as the reference for everyone. Just as important to his superior technical knowledge is Tim's wonderfully upbeat attitude. When difficult decisions were to be made or unforeseen problems arose, Tim was an uplifting source of hope and "can do" support. The value of these personal qualities cannot be overestimated. It therefore with great enthusiasm, that I whole heartily recommend the use of Mr. Fichtner's services and design needs. He truly is a gem." "We knew we had quite a challenge ahead of us when we began designing our new office layout. Our goal was to take our existing space and add on the area of an adjacent vacant suite and retain the form and function of a newly designed office. Tim Fichtner's wealth of knowledge, experience and countless hours of fine-tuning our plan was paramount to our success. Tim listened to the ideas and concerns which my staff and I hand and implemented them into a fantastic design. 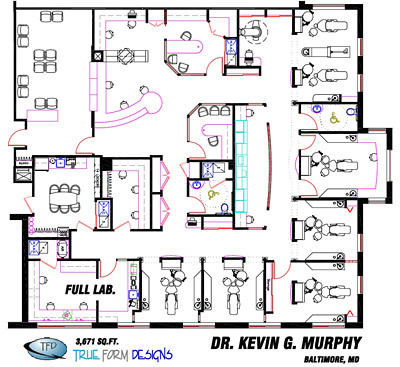 Tim's knowledge was extensive not only with the design and flow of the office, but also with his vast understanding of dental equipment and ergonomic efficiency. He was able to implement our wish list into a great design, which works well for our prosthodontic specialty practice. We were pleased with the hands-on approach that Tim gave us. He made himself available for questions and meetings. Tim took a potentially stressful situation and helped make it exciting and enjoyable. The office we enjoy working in truly is a reflection of Tim's wonderful talent and attention to detail."